My tutor's comments: I can see why you like this more (than my self-portraits, see February archives for my first and second attempt at self-portraits), it is easier, it is less revealing, it risks less. This work seems to me to be very stylised in a way that I would describe as decorative. 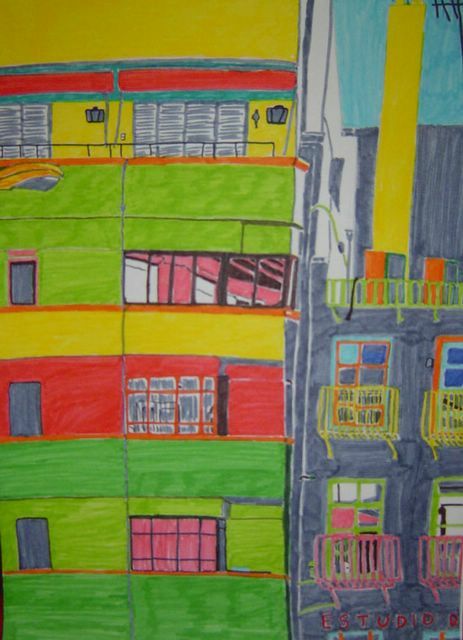 It has a strong emphasis on surface, pattern and an inventive, and largely subjective, use of colour. To what extent is this decorative style determined by the limitations of the media you are working with? To what extent do you consider it to be your own? 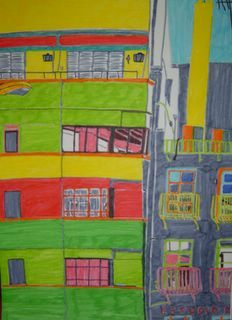 It is a style that reminds me of the work of David Hockney, Henry Matisse, Friedensreich Hundertwasser and Gustave Klimt, among others. These are all artists you will probably enjoy looking at if you are not already familiar with them. However this decadent enjoyment of surface is only one aspect of art and leaves much unexamined. makes me want to look at different places again. ... love to see you paint.